MLB doled out the first no-pitch intentional walk in Major League history during the annual pre-season Battle of the Bay Bridge Series in San Francisco. Melvin summons an intentional walk. 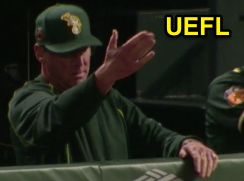 With one out and runners at second and third base in the bottom of the 8th inning of Friday's Athletics-Giants game, A's Manager Bob Melvin elected to use the no-pitch intentional walk rule now afforded to teams in order to load the bases. Official Scoring: The walk was credited to A's relief pitcher Ryan Dull, whose pitch count remained unaffected as Giants batter Brandon Crawford simply jogged to first base. Procedure: In order to issue the free pass, Melvin simply displayed a hand signal of "four" in the direction of HP Umpire Tom Woodring as Crawford approached the batter's box. > Base Coaches must stand within their box until play begins.